Used on Auto Bodies, Tanks, HVAC Units, etc. 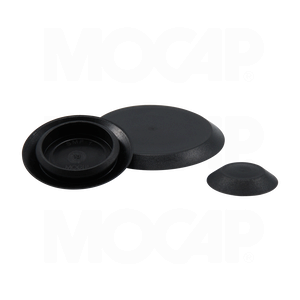 MOCAP LDPE Sheet Metal Hole Plugs feature a flush head and are designed for standard hole sizes. These snap-in sheet metal hole plugs provide an attractive finish and a secure fit. MOCAP polyethylene plastic flush head sheet metal hole plugs are used to plug holes on appliances, automobiles, tanks or anywhere a finished look is needed. SMFS Series sheet metal plugs available in sizes to fit 3/8" to 4" diameter holes. Flush Head sheet metal hole plugs to fit 8mm to 22mm holes. Recessed Head sheet metal hole plugs to fit 1/2" to 2-1/2" holes. MOCAP stocks Sheet Metal Hole Plugs Flush Standard in many sizes for immediate shipment.